Now that plants are beginning to bloom and the weather is turning warmer, many of us will be opening our windows and pulling out our cleaning supplies for some serious spring cleaning. For some, spring cleaning can also mean exposure to harsh chemicals, known as volatile organic compounds (VOCs), which are present in many household cleaners. These compounds contribute to indoor air pollution. Along with causing respiratory issues, common VOCs have been linked to serious health risks from birth defects to increased risk of cancer according to the Center for Disease Control (CDC). These same chemicals are also harmful to the environment whether you pour them down the drain after you’ve finished cleaning or wash them out in the laundry. You can protect yourself, your family and the planet by using environmentally friendly cleaning supplies made with natural, nontoxic ingredients. Many of these products only cost a little more than their dangerous counterparts and are offered in a variety of pleasant scents. 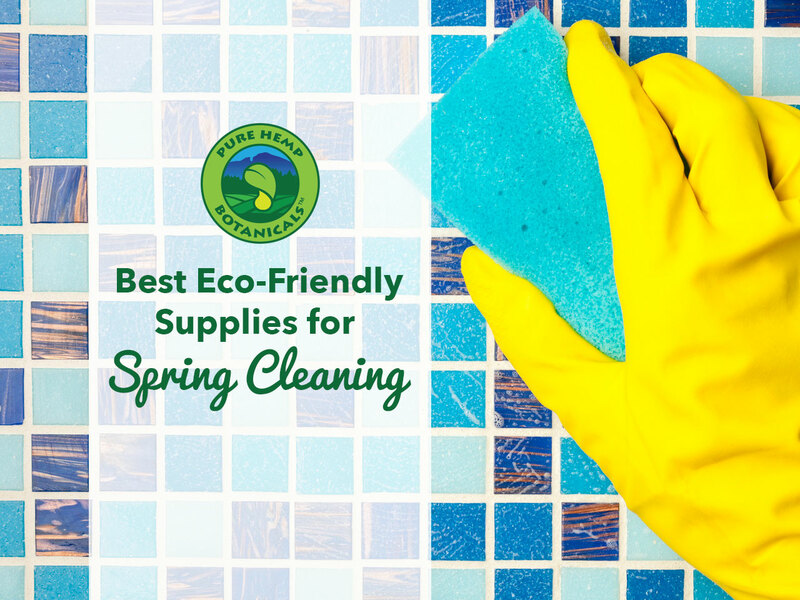 We have put together a list of 7 of our favorite eco-friendly cleaning supplies for all of the most common tasks on your spring cleaning checklist. These botanically derived products will leave your home looking and smelling as fresh as spring! We all know that dirt builds up on the outside and inside of windows. Cleaning your windows—inside and out—is probably at the top of your spring cleaning list. Who wants their view of newly budding trees and blooming flowers obscured by a year of grim? Mrs. Meyer’s Lemon Verbena Glass Cleaner is one of our favorite ammonia free glass cleaners. Like all of Mrs. Meyer’s cleaning products, it is at least 99% naturally derived and has a great scent! It is awesome at removing built up dirt and leaves you with sparkling, streak free windows. If you’re planning to tackle the window screens too, mix a little bit of Mrs. Meyer’s Lemon Verbena Dish Soap with warm water and scrub them with a brush and then rinse thoroughly. Your vacuum is the best tool for collecting the dust that nestles behind furniture and settles on top of window casings and ceiling fans. Murchison-Hume Furniture Spritzer is a great tool to reach for when you take everything—candles, books, knickknacks, etc.—off your shelves and surfaces to wipe off the dust that has settled on and around it. This all-natural, biodegradable colloidal cleaner (containing surfactants derived from sugar cane) can be used on most kinds of furniture including lacquer, wood, plastic and even upholstery. It’s chlorine-free, non-toxic and 100% cruelty-free. It’s perfect for banishing dust and removing animal dander. You can choose between an Original Fig or Australian White Grapefruit scent. Grease has a tendency to accumulate on every surface in the kitchen from your counters and stovetop to cabinets and walls. When you’re ready to scrub away a year’s worth of stubborn surface grime, J.R. Watkins Multi-Purpose Tradition Degreaser is a powerful tool. This natural, biodegradable cleaner is strong enough to make even an old charcoal grill look clean as new. Just mix a little bit with warm or cool water and begin scrubbing away! Wood furniture gets dull over time. Eco Me Wood Polish with a lemon fresh scent is made with a combination of essential botanicals and plant based ingredients. Along with removing dust and dirt, this polish will give protect your wood furniture and give it a lovely sheen. Unlike many synthetic polishes, it is safe for use near food surfaces and doesn’t contain phosphates, synthetic fragrances or harsh chemicals. You don’t have to worry about the yellow build-up that other polishes can create. Upholstered furniture needs some extra loving in the spring just like wood furniture. It’s a good idea to take your cushions outside and gently beat them to get out dust. You can also use a vacuum to clean crevices and pull out dust. If you need to work out some stains, Vaska Spotoff Spot Remover is a gentle, natural spot cleaner that can even remove wine without damaging fabric. Vaska specializes in making 100% biodegradable, all natural and hypoallergenic fabric cleaners that are safe for the environment. Their spot cleaner can get out tough stains and dirt without discoloring or staining your upholstery. Deep-cleaning carpets and rugs at least once a year is an especially important task for people who suffer from allergies. All of the pollen, animal dander, dust and dirt that can accumulate in carpets and rugs and remain undisturbed by vacuuming can aggravate allergies and trigger asthma attacks. A rotary shampoo machine or a hot-water extraction machine can draw out all of these. Many synthetic carpets and rugs with waterproof backings can be deep-cleaned without needing to hire a professional. Rugs without backings, such as Orientals, generally require professional cleaning. Biokleen Carpet & Rug Shampoo is a professional grade cleaning solution that you can use at home. It is free of harsh chemicals and fumes. It is able to get out tough stains and trapped odors because of the unique blend of citrus extracts, grapefruit seed and plant-based surfactants. The last surfaces to tackle are your hard floors. Whether you have wood floors or tile, vinyl or linoleum, Method has a squirt and mop formula that smells as amazing as your floors will look. Method Squirt + Mop Floor Cleaners are non-toxic and biodegradable. Though their cleaners are wax free they will make your floors shine and won’t leave any streaks. Though the ergonomically designed shower-nozzle can cover floors evenly when sprayed on them directly, you will see the best results if you spray it onto the top of a flat floor mop and mop with long strokes. When it comes to scents, you can choose between their ginger yuzu formula that has a tangy, coconut smell or their lemon ginger scent. Have you been converted to environmentally friendly cleaning supplies? If you have a favorite that we left off our list, share it with us in the comments!